Comprehensive sampling of the tumor microenvironment, both in space and in time, is expected to have a major impact on cancer research, diagnosis and treatment planning. 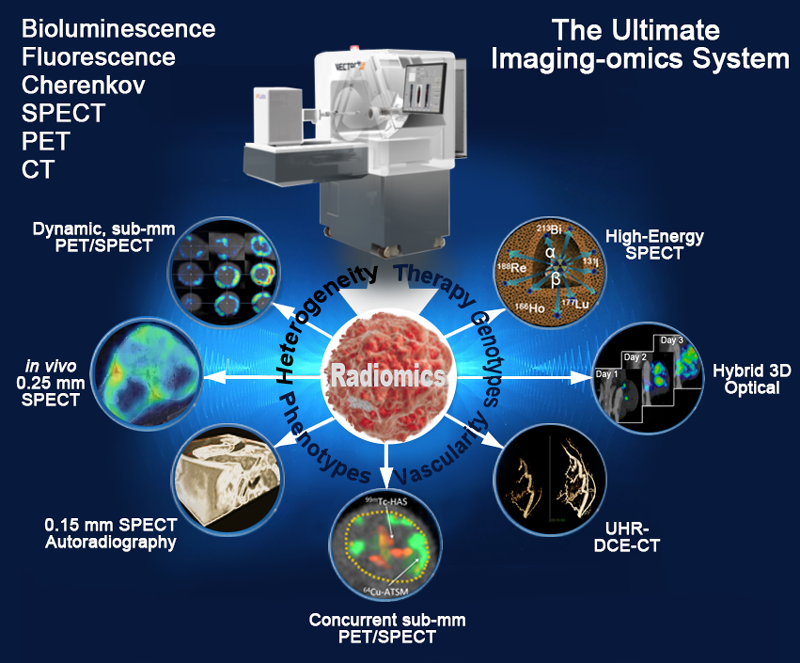 This so-called radiomics research approach requires the high-throughput extraction of large numbers of in vivo image-based features from tumors to correlate therapy response to genomic and proteomic patterns. 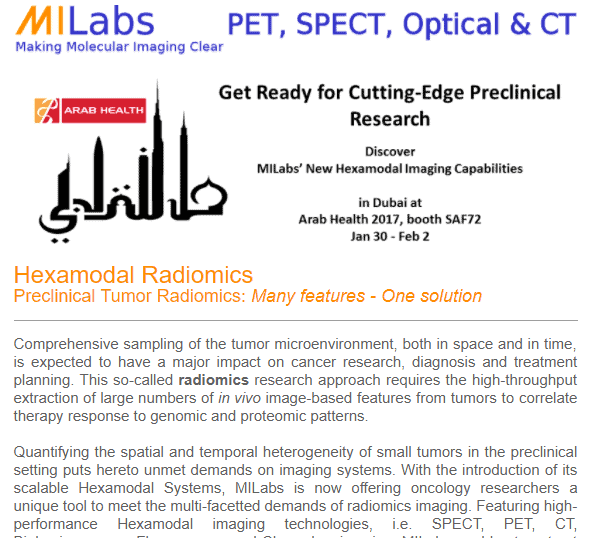 MILabs’ Hexamodal preclinical imaging platform for rapid, multi-feature determination of tumor radiomics. Tumors are spatially and temporally heterogeneous. MILabs’ preclinical imaging systems offers the unprecedented ability to dynamically image tumors with SPECT and PET at sub-mm resolutions, even down to 0.15 mm resolution for SPECT. This unique ability enables in vivo quantification of physiological or biological factors that influence tumor response [1–4]. The physical tumor microenvironment contributes significantly to carcinogenesis, cancer progression and metastatic dissemination. With MILabs’ exclusive 3D SPECT/CT autoradiography technique, the labor intensive and time consuming method of serial section and traditional immuno-histochemical staining for protein profiling is becoming a thing of the past. Moreover, for in vivo applications, its multi-parametric simultaneous PET/SPECT imaging of co-injected tracers enables to uncover novel imaging characteristics linked to tumor phenotypes [5,6]. Factors that impede drug delivery include the complicated, tortuous nature of tumor vasculature. The MILabs’ ultra-high resolution Dynamic Contrast-Enhanced CT (DCE-CT) feature makes it possible to analyze temporal dynamic changes in perfusion parameters in tumor tissue. In addition, simultaneous imaging of vascularity and hypoxia with Concurrent PET/SPECT can differentiate hypervascular from hypovascular tumors, thus guiding the decision for applying antiangiogenic, anti-vascular, or anti-hypoxia therapies . Radiogenomics analysis reveals gene-expression patterns which often underlay prognostic radiomic signatures, hence providing further insight into intra-tumoral heterogeneity. MILabs’ Hybrid Optical sub-system imaging capability enables imaging of multi-modal reporter gene/reporter probe system thus allowing one to select an appropriate imaging modality for a particular application, cross-validate information captured by each imaging modality and facilitate translation of preclinical imaging techniques to the clinic [8,9, See Brochure]. Targeted radionuclide therapy is one of the most intensively developing directions of nuclear medicine. MILabs’ offers the most versatile preclinical imaging system ever for evaluating strategies to improve radiotherapy, all with the aim of increasing the effect on the tumor or decreasing the effects on normal tissues. Virtually any α-, β-, or Auger electron-emitter with gamma-rays below 950 keV can be imaged with the system and its therapeutic effects quantified. Now you can tailor your irradiation therapy to tumor type and heterogeneity, as well as the inhomogeneity of the radionuclide distribution, pharmacokinetics, etc… No longer will your imaging system limit your options [10–13]. Miest TS, Frenzke M, Cattaneo R. Measles virus entry through the signaling lymphocyte activation molecule governs efficacy of mantle cell lymphoma radiovirotherapy. Mol Ther. 2013 Nov;21(11):2019–31. Shao G, Zhou Y, Wang F, Liu S. Monitoring glioma growth and tumor necrosis with the U-SPECT-II/CT scanner by targeting integrin αvβ3. Mol Imaging. 2013;12(1):39–48. Branderhorst W, Blezer E LA, Houtkamp M, Ramakers RM, van den Brakel JH, Witteveen H, et al. Three-dimensional histologic validation of high-resolution SPECT of antibody distributions within xenografts. J Nucl Med. 2014 May;55(5):830–7. Ivashchenko O, van der Have F, Villena JL, Groen HC, Ramakers RM, Weinans HH, et al. Quarter-Millimeter-Resolution Molecular Mouse Imaging with U-SPECT+. Mol Imaging. 2014 Nov 1;13:1–8. Adachi N, Yoshii Y, Furukawa T, Yoshimoto M, Takeuchi Y, Inubushi M, et al. In Vivo Simultaneous Imaging of Vascular Pool and Hypoxia with a HT-29 Tumor Model: the Application of Dual-Isotope SPECT/PET/CT. International Journal of Sciences: Basic and Applied Research (IJSBAR). 2016. p. 26–39. Miwa K, Inubushi M, Takeuchi Y, Katafuchi T, Koizumi M, Saga T, et al. Performance characteristics of a novel clustered multi-pinhole technology for simultaneous high-resolution SPECT/PET. Ann Nucl Med. 2015 Jun 19;29(5):460–6. van Oosterom MN, Kreuger R, Buckle T, Mahn W a, Bunschoten A, Josephson L, et al. U-SPECT-BioFluo: an integrated radionuclide, bioluminescence, and fluorescence imaging platform. EJNMMI Res. 2014 Jan;4:56. Suksanpaisan L, Pham L, McIvor S, Russell SJ, Peng K-W. Oral contrast enhances the resolution of in-life NIS reporter gene imaging. Cancer Gene Ther. Nature Publishing Group; 2013 Nov;20(11):638–41. ter Heine R, Lange R, Breukels OB, Bloemendal HJ, Rummenie RG, Wakker AM, et al. Bench to bedside development of GMP grade Rhenium-188-HEDP, a radiopharmaceutical for targeted treatment of painful bone metastases. Int J Pharm. Elsevier B.V.; 2014 Apr 25;465(1–2):317–24. de Swart J, Chan HS, Goorden MC, Morgenstern A, Bruchertseifer F, Beekman FJ, et al. Utilizing High-Energy γ-Photons for High-Resolution 213Bi SPECT in Mice. J Nucl Med. 2016 Mar;57(3):486–92. van der Have F, Ivashchenko O, Goorden MC, Ramakers RM, Beekman FJ. High-resolution clustered pinhole (131)Iodine SPECT imaging in mice. Nucl Med Biol. 2016 Aug;43(8):506–11. AACR, April 1-5, 2017, Washington, DC. G-SPECT is not available for clinical use. Sale for such use depends on local (pre)market approval, including FDA and CE certifications.